IM: What sparked your interest in comics? MW: Exposure at a young age. I grew up in New York City and my family regularly got the local newspapers (the New York Post and the New York Daily News). The first thing I turned to? The comics section. I would read Peanuts, as well as Garfield and the Family Circus. Later on, I would read collections of these comics collected in paperbacks at my local library. IM: How have you developed your craft over the years? My education was piecemeal. I’d been drawing on an on-and-off basis for years, but it wasn’t until 2002 that I drew on a regular basis. While I did do a lot of practice and self-study, I went to night classes at the School of Visual Arts in New York City. There I learned life drawing, perspective, and painting, but most importantly, the nuts and bolts of comics, from names like Tom Hart, Matt Madden, and Tom Motley. Other than that, I just rely on plenty of practice and heading to life drawing sessions. IM: Who would you consider to be your major influences and inspirations? MW: One would be the German Expressionist painter Paul Klee. He’s my favorite painter and I love his use of color with line. But more than that, he really aimed to capture the world the way he saw it, rather than how people told him to see it. I draw what I see and I depict the world as I see it. I’ve had problems recently with detractors telling me to draw realistically. If you want to capture reality, then take a photo! Another influence has been Charles Schulz. The artwork of Peanuts has always been a contrast to realism or the drawing of Walt Kelly and Bill Watterson. I use simple artwork, which also earns me criticism. I’ve been called “lazy” or just plain “stupid” for not drawing realistically or photo-realistically, but I don’t think drawing in that way would help me. My simple drawing, like that of Schulz, allows readers to project their own interpretations into the lines. Ultimately, the people who enjoy my work are the ones who put much in there to begin with. The complex writing I use too—like Schulz again—helps. IM: It’s been almost two years since the last time we’ve talked (back in SP! 74). What’s been going on in the interim? MW: The third volume of Sunnyville Stories has been released and I feel Sunnyville is starting to grow the beard. 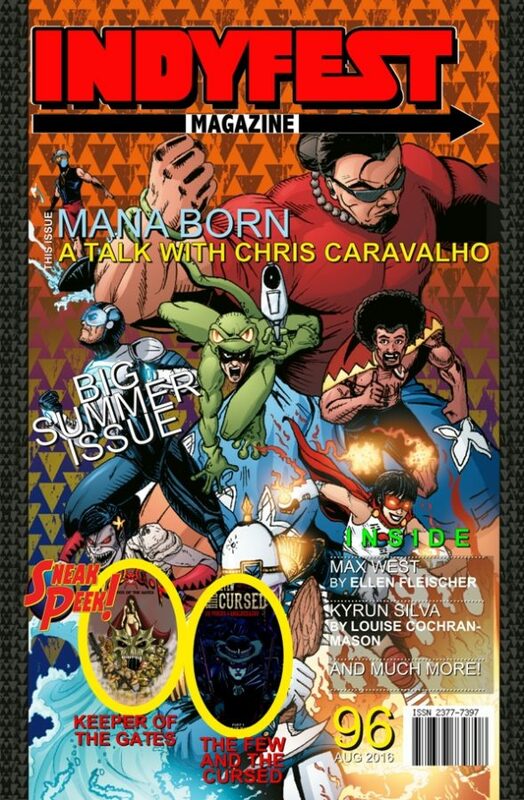 My drawing and layouts got much better, plus I have an established universe and continuity to work with. We’re starting to see Rusty think about his future; he reveals that he wants to be an animator, which leads him into conflict with his mom. I’ve also been dropping hints that Samantha has feelings for Rusty, but he’s not aware of that. 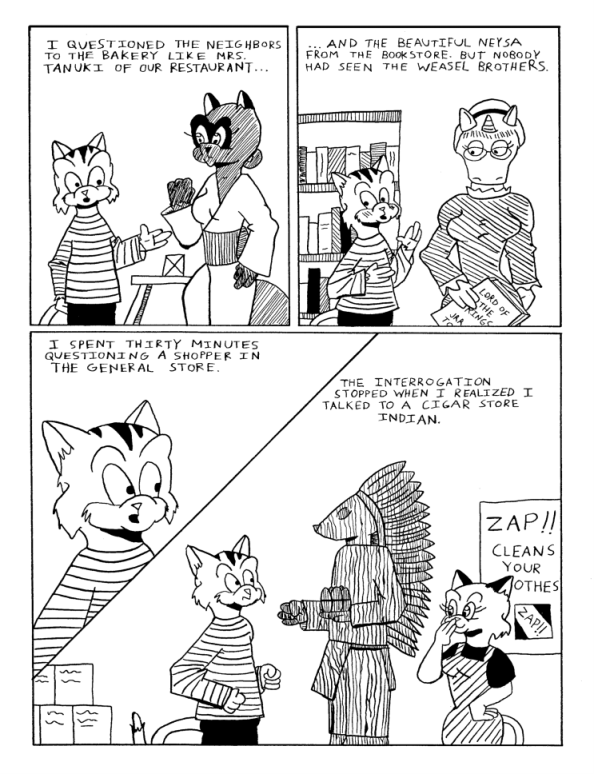 There’s been more awareness of Sunnyville, too; I’ve gotten many good reviews, gotten more fan mail, and even made my local newspaper in Fargo, North Dakota! Working to promote Sunnyville is a challenge too. I have to rely on word-of-mouth and social media, but I still continue using direct mail to reach potential vendors and libraries with big budgets. As for other ideas, one I’ve been developing is Ingmar the Wanderer, a blind weapon-master wielding a sword cane. This character does co-exist with the Sunnyville universe and may do crossovers. 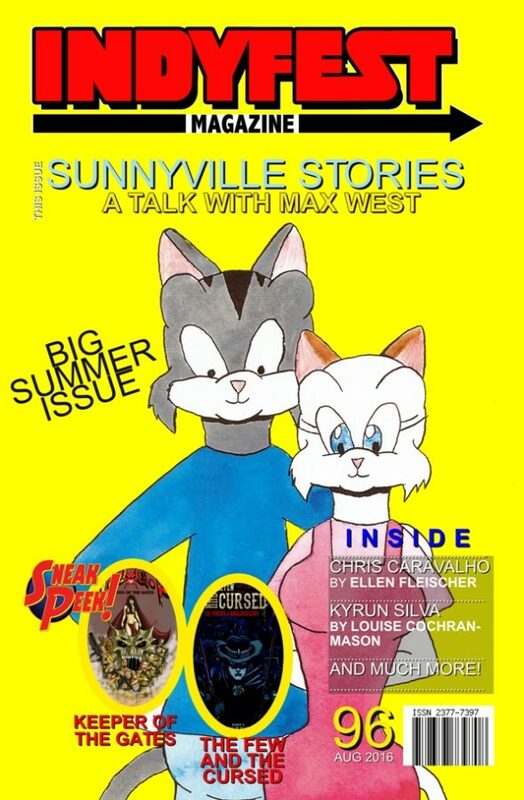 IM: For those of our readers who’ve come aboard since #74, can you give us an elevator pitch on the Sunnyville Stories? MW: Sunnyville Stories is a small-press title about a big world. It tells the saga of two teenagers, Rusty Duncan and Samantha “Sam” Macgregor, in a small and remote village, having daily adventures. IM: Tell us a bit about the characters; who they are, what makes them tick, etc. MW: The stars of the series are Robert “Rusty” Duncan and Samantha “Sam” Macgregor. Rusty is a wisecracking city boy who moves to Sunnyville at the start of the series; he finds it a completely different world from the big city he used to live in. Rusty doesn’t have all the amenities he took for granted in the city, like supermarkets, shopping malls, movie theaters, video arcades and so on. Sam is a sweet country girl who has lived in the small village all her life and gets along with just about everyone. These two polar opposites quickly become close companions. The mechanics of their relationship is that of the classic “straight man and wise guy” routine. Sam plays the straight man to Rusty’s wise guy. She is there to provide reaction whenever Rusty says or does something funny. She’s also there to set Rusty up to do funny things. Rusty and Sam are also foils—Rusty is an only child, whereas Sam comes from a big family. Rusty is from a big city, while Sam is from a little country village. Sam wins friends by being nice, whereas Rusty relies on his sense of humor to fit in. While I tap into archetypes for my characters—Rusty is the wise guy, Sam is the nice girl, Rose Von Straussen is the local rich girl, Ragnar and Olaf (sons of the town bakers) are the best friends—I aim not to make clichéd stereotypes. Rusty may joke around, but it’s implied that he needs to be accepted by others. Sam is a sweet girl, but even she gets annoyed or outright angry. IM: And how about the society/world that they inhabit? MW: Sunnyville is a remote village surrounded by vast forest and mountains. Only connected to the outside world by some roads and a set of train tracks, time stands still here. The residents go about their daily lives, ignoring the rapid (and chaotic) changes of the modern world. The town has a general store (no supermarket), only one restaurant (a Japanese restaurant—no fast food or chain restaurants) and no other amenities like shopping malls and movie theaters. Sunnyville was influenced by my time living in rural North Carolina in the first half of the 1990s; it was very rural and had none of the luxuries I took for granted living in New York City. As for the society itself, there’s a definite generation gap. The adults are culturally and psychologically stuck in the first half of the twentieth century ,while the kids are stuck in the second half of the twentieth century. The kids (by that, I mean teenagers and small children) live in a world that’s a kitbash of the 1950s and 1980s with elements of the 1960s, 1970s and 1990s. They are into personal technology, like computers and video games, whereas the adults (especially the moms) are suspicious of such tech. 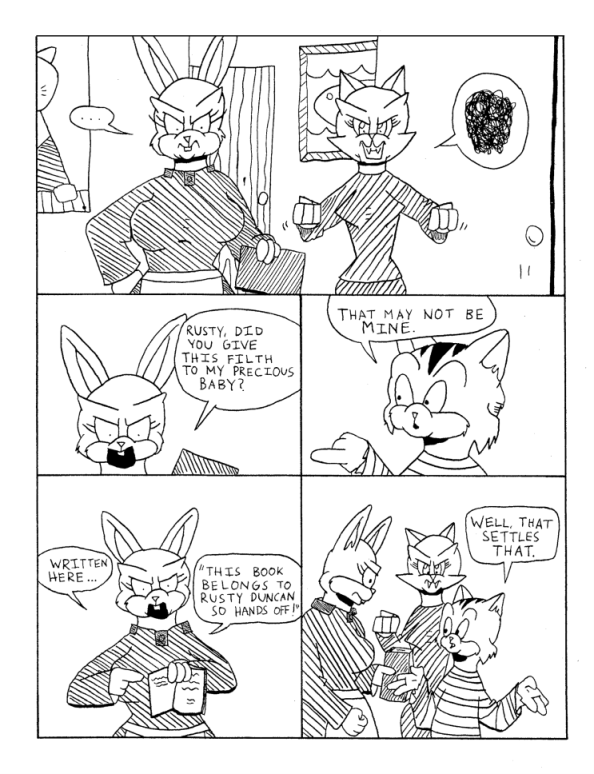 An example of this generation divide was in Sunnyville #4 (collected in the second volume) with Mr. Jakes and his nephew Roger. Mr. Jakes was an elderly badger who fixed the town’s appliances. He liked to work with old-fashioned tools, while his younger nephew was into computers and acted more like a mad scientist. IM: Let’s talk a bit about your process. How do you go from inspiration to publication, as it were? MW: When I need ideas, I take them from different sources, like my own personal experiences or other sources, like TV and movies. Once I get an idea, I try to come up with a basic plot in a few sentences, like ‘Rusty goes on a game show to win big prizes,’ or ‘the adults leave the children in town for one day,’ and pair it with a theme of some kind like ‘greed’ or ‘finding your place in the world’. I’ll do a story treatment (a few handwritten pages outlining the conflict and resolution), which is then turned into a typed script. From there, I sketch out thumbnails, design any new characters, and gather references. I do pencils, lettering, inking, and the cover art; I also will handle graphic design and digital formatting for print (both individual pamphlets and collected books). On top of all that, I’m always marketing the series with the internet, leveraging press contacts, and soliciting vendors (like libraries and mail order companies). IM: Who would you say your target audience is for this series? Would you say that it would appeal to fans of particular works or series? If so, which ones? MW: My target has always been the demographic who doesn’t want an assembly-line comic, especially superhero material. I think this would appeal to people who adore newspaper comic strips, especially Peanuts. The writing is complex, the characters are more than meets the eye and I rely on actual comedy as opposed to toilet humor, shock value, or overt contemporary pop culture reference. IM: Is there an overarching plan for the series (i.e. with a definite end-goal in mind), or is this more an ongoing series of adventures? MW: It’s a bit of both. While many of these stories are self-contained vignettes, there are continuity nods (like a character saying, “Remember when we…”) to past stories. There will also be an actual ending to the series, which I had in mind when I wrote the series. IM: Was it always your goal to self-publish? 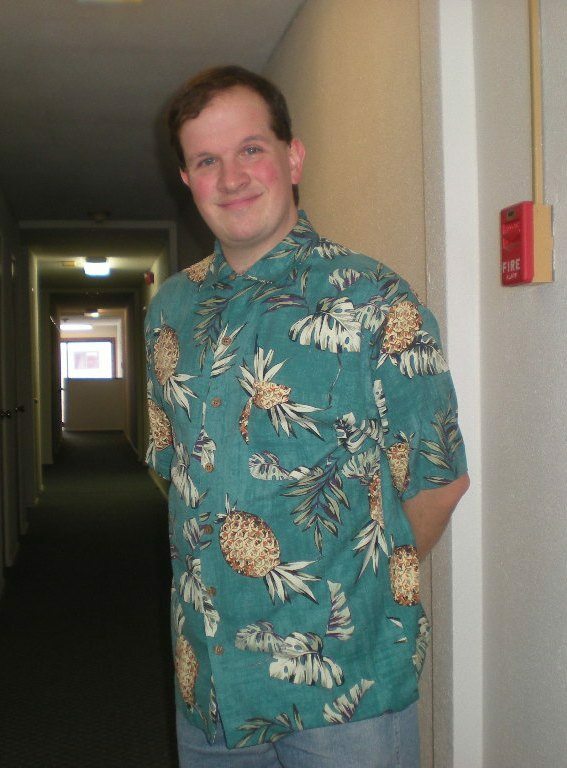 MW: Originally, I did approach a few publishers with the concept of Sunnyville, but it was soundly rejected. At least one publisher simply sent back my proposal with an expletive written across in red marker! To be honest, I’m relieved that the rejections happened. I didn’t want the wrong people getting their hands on Sunnyville. I wanted full creative control; it made me anxious to have an editor telling me, “No, you can’t draw that.” I didn’t want to be told to change my work to make it suitable for a perceived market or to fit standards of political correctness. In the end, I made the right decision to go it alone. IM: Have there been any lucky breaks or challenges along the way that you’d like to share with our readers? MW: I’m a one man operation. Even if you decide to go through a publisher, you’ll need to market and sell yourself. Read books on marketing. (The Guerrilla Marketing series is a great read!) It also helps to get connections both online and offline; establish good relationships with vendors and media contacts. IM: What advice would you give to someone thinking of launching their own comic? MW: Keep working at it and be persistent. Just because you’re not successful right away doesn’t mean you’ll never be successful. IM: Is there anything exciting on your horizon over the next few months? MW: I’ll be selling at a convention again: CoreCon, in Fargo, North Dakota. I haven’t sold at any conventions since 2013. After I finish my present work (Sunnyville Stories #14), I plan to take a sabbatical, where I’ll develop other ideas (like Ingmar the Wanderer), raise money, investigate Kickstarter, and hone my skills. 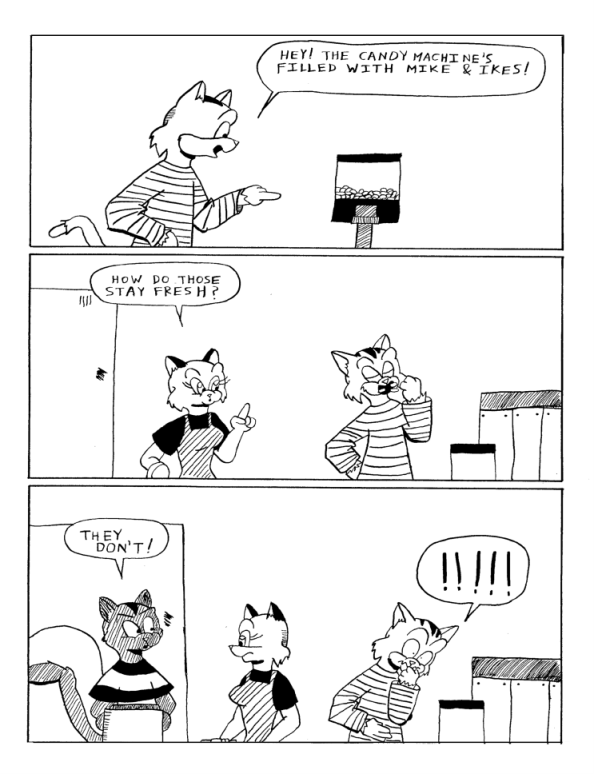 In addition to working on basic drawing skills, my aim is to take a closer look at the comics medium, understand its inner workings, and apply them to Sunnyville. IM: Is there anything else that you’d like to share with our readers that we haven’t touched on, yet? MW: Computers and software are handy, but don’t overlook traditional tools, like pencils and pens. Even if you do everything on the computer, train your hands and your mind. MW: I regularly update my blog at sunnyvillestories.com and I’m also on Facebook at http://facebook.com/sunnyvillestories. My trade paperbacks are available through Amazon and wherever books are sold. They are also available through Brodart Company for libraries, as well as both Ingram and Baker & Taylor for booksellers. This entry was posted in 96 and tagged Ellen Fleischer, Max West, Sunnyville Stories on August 12, 2016 by aipman1.